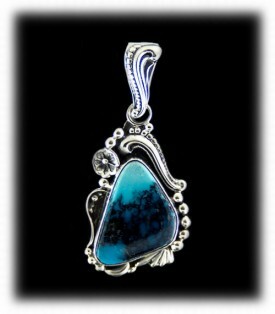 Turquoise Pendants are a specialty at Durango Silver Company! 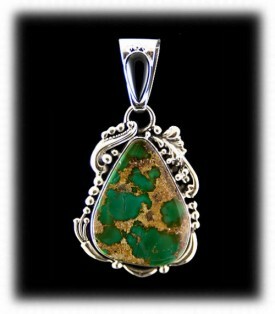 We produce many types of Turquoise Pendants from simple to high Fashion Turquoise Pendants and Necklaces. 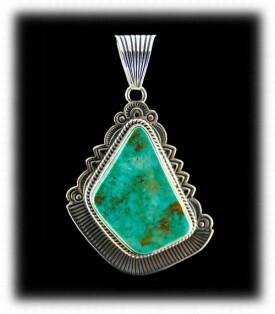 We make simple designed Silver Pendants to elaborate Turquoise Pendants with intricate silver work and Inlay Turquoise. All of our Pendants as well as our Turquoise Jewelry is made with substantial weight Steling Silver and exceptional authentic Turquoise Gemstones. First and foremost, Durango Silver Company produces high quality Turquoise Pendants as well as all of the other Turquoise Jewelry that we make. Our Turquoise Pendants are unique to our company as they are all one-of-a-kind, handcrafted and only sold by us. 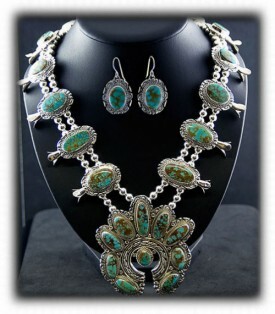 If you are interested in high quality American made Southwestern Turquoise Jewelry, you have come to the right place. We can help you find the Silver Pendant of your dreams, that has been handmade in America. Our selection of silver pendants is very diverse. We study silver jewelry, Turquoise and gemstones to help in educating our customers. Keep reading for more information or Turquoise Pendants. Below are examples of our Turquoise Pendants and Necklaces with descriptions showing you the deference between them. Here are two nice, bezel set, Turquoise Pendants. Many people do not like a lot of filigree or Silver work on their Pendant, we put a Silver bezel and a Silver back around a beautiful gemstone and this is called a bezel set Pendant. 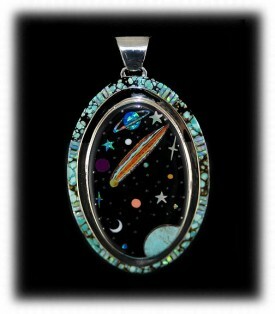 We make a lot of Mens Turquoise Pendants that are bezel set stones. This teardrop shaped green Manassa Turquoise Pendant is set in a simple bezel set design by Native American artist Freddy Charlie. 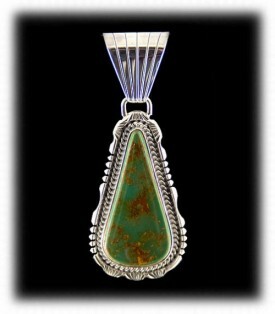 This Colorado Turquoise pendant focuses on the wonderful Manassa Turquoise cabochon from Colorado. This natural blue to green fade Turquoise cabochon has wonderful golden brown matrix. 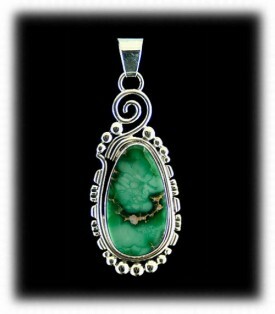 This green Colorado Turquoise pendant was handmade in New Mexico, USA and is hallmarked & F.C. and Sterling. This bezel set authentic White Buffalo Turquoise Pendant was made by John Hartman. 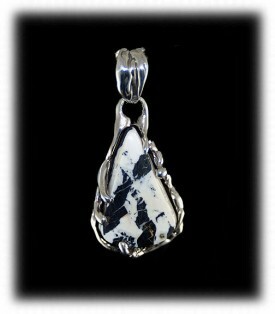 Gorgeous Stark White and Black patterning in this stone is highlighted by wisps of black smoke matrix. Natural Authentic White Buffalo from Tonopah, Nevada. 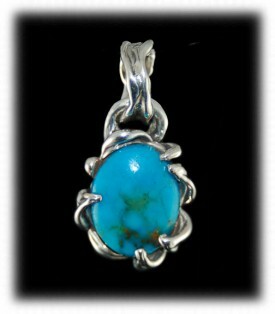 This Turquoise Pendant features a large custom bail that will fit a large Omega chain or beads. 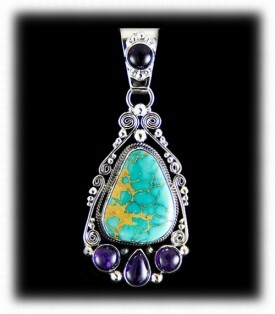 Southwestern style free form deep green Manassa Turquoise Pendant by Native American artist Albert Jake. This Native American Handcrafted pendant is made in the traditional Navajo style and has a freeform Deep Green Manassa Turquoise cabochon. 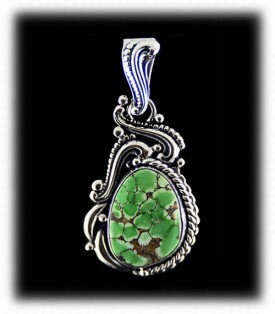 This high-grade green Colorado Turquoise is bezel set and surrounded by a rope or cable design with hand stamped silver surrounding that. This green American Turquoise Pendant was Native American handmade in New Mexico, USA and is hallmarked "A.Jake and Sterling". Large Navajo made, pear shaped Manassa Blue Turquoise pendant by Native American artist Albert Jack. This Colorado Turquoise Pendant has a very nice hand stamped design typical of what Navajo Silversmiths are so well known for. The bail is fairly large which will accomidate most any size of chain appropriate for this Pendant. This Victorian styled Lime Green Stennich Turquoise Pendant was made by Navajo Artist Vernon Begay. This wonderful Victorian style filigree pendant was designed by Dillon Hartman and fabricated by Navajo artist Vernon Begay, it features a gem grade spider web matrix, Lime Turquoise Cabochon. Handcrafted in New Mexico and stamped "VB and Sterling". Victorian Style Blue Diamond Turquoise Pendant by John Hartman. This is a wonderful pendant features a freeform Black Spider Web Blue Diamond Turquoise cabochon surrounded by repose, raindrops, and floral designs. This pendant is hung from a matching Victorian designed bail. Artisan Handmade in Durango, Colorado USA and stamped "Durango Silver .925 and J. Hartman". This White Buffalo Turquoise Pendant by John Hartman The pendant features a large natural White Buffalo (Tonopah, Nevada) cabochon. The stone is surrounded by a bead and rope design that is three dimensional with raindrops and repose designs. Artisan handcrafted in Durango, Colorado USA and stamped "Durango Silver .925 and J. Hartman, and White Buffalo". 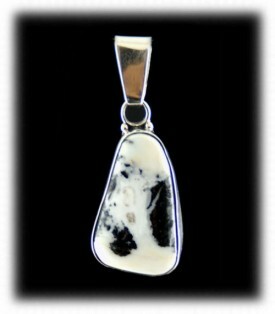 Victorian Style White Buffalo Turquoise Pendant by John Hartman. 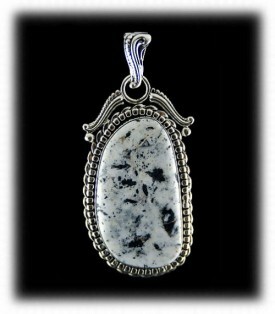 This pendant focuses on an authentic and natural White Buffalo Turquoise geometric cut cabochon. 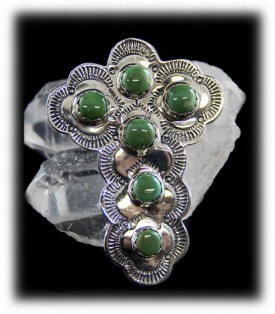 This stone is bezel set and surrounded by filigree Victorian designs. This pendant was artisan handmade in Durango, Colorado USA and is hallmarked "Durango Silver .925 and J. Hartman". The Pendant on the left was Handcrafted with authentic Turquoise Mountain Turquoise from Kingman, Arizona. It was constructed in Sterling Silver with Colorado Gold Nuggets around the edges surrounding the beautiful stone.The Gold Nuggets came from Silverton, Colorado and the piece was made by John Hartman of Durango, Colorado. The Victorian style Royston Turquoise Pendant on the right was also made by John Hartman. 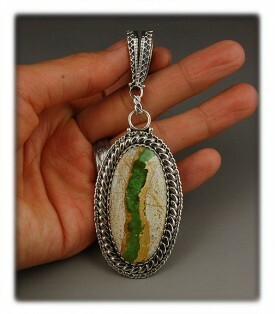 This pendant features a large teardrop shaped, forest green with golden yellow/tan matrix Royston Turquoise cabochon. The large Turquoise cabochon is surrounded by Victorian filigree and raindrop designs. It hangs from a large custom bail that is adorned with a slim teardrop of black onyx and raindrop designs. Artisan handmade in Durango, Colorado USA and stamped Durango Silver .925 and J. Hartman”. Above to the left is a Turquoise Cross Pendant - This Turquoise Cross Pendant was Navajo handcrafted in beautifully hand stamped Sterling Silver with Manassa Turquoise from Colorado. Manassa Turquoise was one of the first Turquoise deposits found by the Native American Indians over a thousand years ago. The Inlay Turquoise Pendant on the right has beautiful inlay work and is an unusual piece. It is called Turquoise Inlay work in the Southwest and has been popular for many years. Today Inlay Turquoise jewelry is some of the most popular jewelry in the world. This particular Pendant is inlaid with Turquoise, Coral, Jet, Pink Shell and Silver. On the left is a elegant Turquoise Pendant made by Navajo Artist Vernon Begay. This gorgeous larger pendant features a high grade bright blue, golden spider webbed Royston Turquoise cabochon. 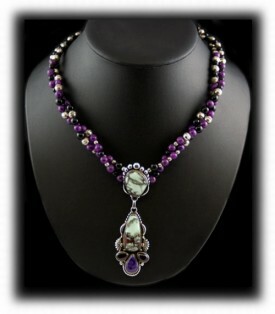 This piece of Turquoise is accented with four deep purple amethyst cabochons on the bottom and one on the bail. Three of the cabochon float below the Turquoise stone and one adorns the custom bale. 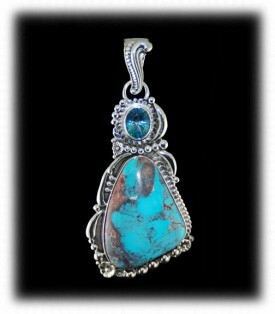 This is a beautiful "Fashion Turquoise Pendant" that was handmade in New Mexico and stamped "VB and Sterling". To the right is a fancy seven stone Bisbee Turquoise Pendant by Vernon Begay. This Large Navajo artisan made Bisbee Turquoise Pendant features one large natural Bisbee Turquoise stone surrounded by six additional Bisbee Turquoise stones. Absolutely stunning! This Sterling Silver Pendant was Native American handmade in the USA and is a one of a kind piece. 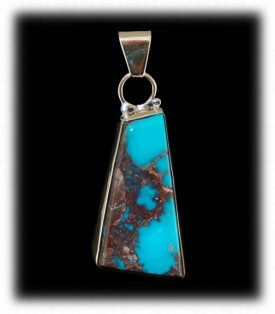 If you are a Bisbee Turquoise collector, here is a great piece! 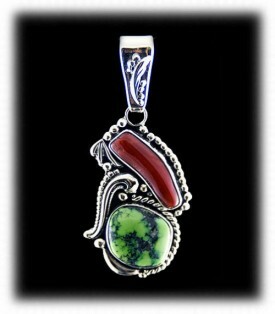 To the left is a Victorian styled Mediterranean Red Coral and lime green Orvil Jack Turquoise Pendant by John Hartman. This one of a kind Turquoise Pendant focuses on a branch cut Ox Blood Red Mediterranean Coral stone and a lime green freeform cut Orvil Jack Turquoise cabochon from Nevada, USA. These two natural high-grade stones are surrounded by cable or rope and Victorian designs. This Lime Turquoise Pendant was artisan handcrafted in Durango, Colorado USA by John Hartman and is hallmarked Durango Silver .925 and J. Hartman”. The Turquoise Pendant to the right was made in the lost wax style with mint green spider web Tortoise Turquoise by Crystal Hartman. 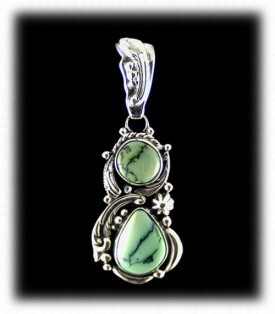 This pendant features a high grade freeform cabochon from the Tortoise Turquoise Mine located in Nevada, USA. This wonderful stone is surrounded by organic, plant root style, designs which were formed by applying layer after layer of molten wax to develop the design. Artisan handmade by Crystal Hartman in Durango, Colorado USA. On the left is a large teardrop shaped Royston Ribbon Turquoise Pendant by John Hartman. This handmade sterling silver pendant features gorgeous Victorian designs surrounding a top grade piece of Royston Ribbon Turquoise. It is Artisan handmade in Durango, Colorado USA and stamped "Durango Silver .925 and J. Hartman". On the right is a two stone, Victorian style, mint green Tortoise Turquoise Pendant by John Hartman. Both the stones and the silverwork shine in this piece. The focus is the two gorgeous mint green, black matrix Tortoise Turquoise cabochons. These great Nevada Turquoise stones are surrounded by filigree and raindrop Victorian designs. This is all hung on a large ornate bail that matches. This piece was handcrafted in Durango, Colorado USA and stamped Durango Silver .925 and J. Hartman. Below are some examples of Turquoise Necklaces produced by Durango Silver Company. To the left is a Blue Diamond Turquoise Necklace, strung on beautiful spiderweb Turquoise and Black Onyx Beads. A Classic Blue Diamond look with modern fashion design. 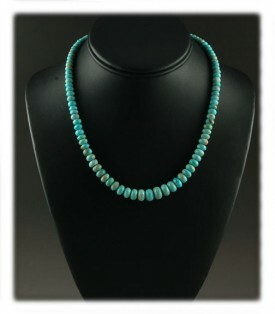 The clasp is custom made and features two Blue Diamond Turquoise cabochons. 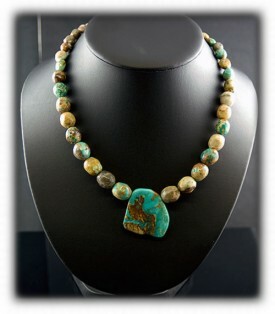 This Turquoise Necklace was created by John Hartman. To the right is a natural, red web, Tortoise Turquoise Necklace with Garnets and Sugilite strung on Sterling Silver, Black Onyx and Sugilite beads. This is a stunning necklace made by John Hartman and the beadwork was done by Nattarika Hartman. Red Web Tortoise Turquoise is very rare! To the left is a Navajo made bright blue Manassa Turquoise Squash Blossom Necklace. This wonderful classic Turquoise Necklace features 22 wonderful spider web Turquoise cabochons from the King's Manassa mine of Colorado. The top grade stones are set in a gorgeous traditional squash blossom design, bezel set with a rope or cable design and hand stamp work surrounding each stone. At the bottom of the necklace sits a wonderful ten stone Naja centerpiece. All stones match and were cut from the same vein of Turquoise. Every one of the twenty two stones was hand cut by Bill King owner of theManassa Turquoise mine in Manassa, Colorado USA. The wonderful Native American Turquoise Squash Blossom necklace was artisan handmade in New Mexico, USA and is hallmarked Sterling and E.A. The necklace comes with a set of matching dangle earrings. To the right is a hand rolled Royston Boulder Turquoise Beaded Necklace with graduated round beads featuring a large Royston Turquoise focal bead by Nattarika Hartman. This necklace was hand beaded in Durango, Colorado. We hope you have enjoyed our presentation on Turquoise Pendants and have gained some useful knowledge from it. We invite you to learn more about Turquoise and Turquoise Jewelry by following the links in our Learning Center to other informational pages that we have written on different topics related to Turquoise Jewelry. In addition, we would like to invite you to join our E-Mail Newsletter - about once every other month we send out a Newsletter to inform our members of what's happening with Durango Silver Company, new products, specials for our members and more. We also have a monthly drawing from our member base to give away free Turquoise Jewelry from our company. Please take a moment to become one of our friends by signing in below. Thank you for reading about Turquoise Pendants, we hope this page will help you to purchase the right Tuquoise Pendant for you.